All members must have noticed the fine addition to our course at the side of the first fairway. That fine building... our new halfway house. Many, many thanks to member Nick Edge for his most generous contribution to the club. 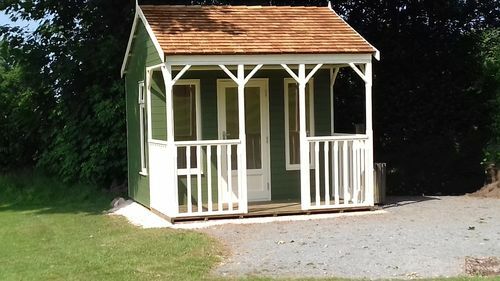 Smiths Sectional Buildings is his company and they spent many hours removing the old shed, digging a base, laying new concrete and erecting a fine pavilion. ... that would grace many cricket fields and golf clubs too. No expense spared, Nick is even plumbing it in for future events. At a brief ceremony and a bottle of fizz opened the halfway house and its first official function was on Lady Captain's Day on July 17. Seen here are Lady Captain Margaret Playfair with Captain Lloyd Readhead, looking on Chair of Greens Trevor Mellor, Professional Phil Toomer and Vice-Captain John Cushing. And on the right Lloyd and Margaret are toasting the new sponsor Smiths Sectional Buildings.